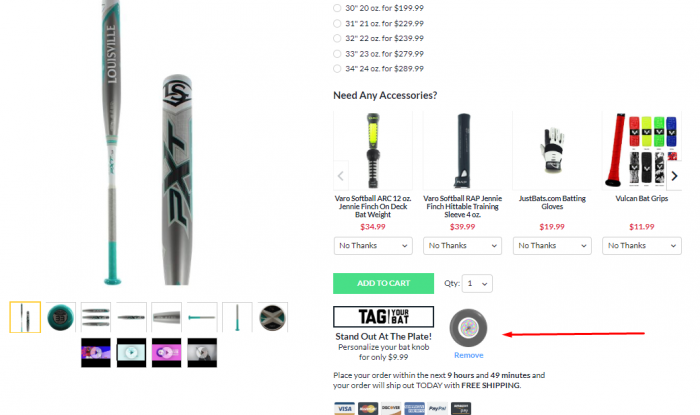 Running a baseball and softball bat site brings with it a few perks, not the least of which is speaking with ancillary baseball products. Chinook Seedery is one of our more recent finds. They make, as you can guess, large sunflower seeds in a handful of unique flavors. They hooked us up with a few bags and we’ve been pounding them ever since. Here is a little diddy on our experience and favorites. The best place to look is directly on the Chinook Seedery site. There you’ll find more information on their process and customer commitment. Buying from them directly, instead of through the Amazon links above, is the less expensive way to go. We realize, however, people’s familiarity with Amazon is often enough of a selling point. We do have a “best sunflower seeds” page. When we originally created it, we did not include Chinook in the voting simply because we didn’t know they existed. They are now added and we will see how they do. 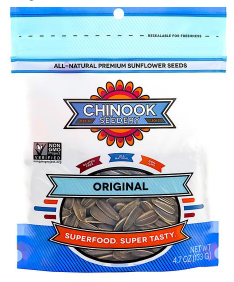 Chinook produces six types of sunflower seeds. They are, in no particular order, Smokehouse BBQ, Hatch Green Chile, Dill Pickle, Parmesan and Pepper, Cinnamon Toast and Original. With the exception of the Dill Pickle (because we didn’t get any), we’ve snacked on each in copious amounts. The seeds are larger than we are used to in traditional David and Spitz brands. Chinook prides itself as a huge seed maker. According to their website these seeds are organic and GMO-free. Parmesan & Pepper is our favorite. These may be the best sunflower seed we have ever had. 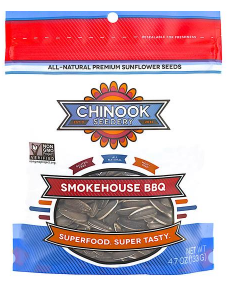 Smokehouse BBQ seeds are also really good. Originals probably come in third, although original seed lovers will feel at home with these. Hatch Green Chile’s are very good, too. Cinnamon Toast were not our favorites, but we found ourselves eating them nonetheless. The jury is still out on Dill Pickle because we have yet to try them. But, we suspect we would like them a lot. 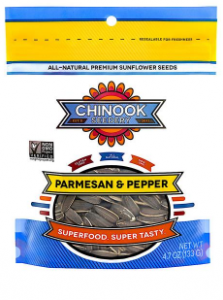 The Parmesan & Pepper Chinook Seedery seeds are not just our favorite of the entire Chinook Seedery line, but may be our favorite seeds ever. We submit we know what we are talking about as we have destroyed pounds and pounds of seeds in our day. And the Parmesan & Pepper are easily on the top shelf of our seed need pile. These could be our second most favorite seeds in the line. Real simple BBQ taste with monster seeds might convince you it is an occasional bite of steak. 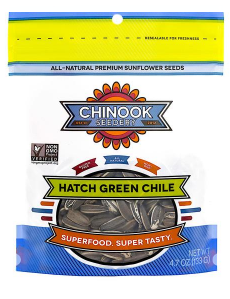 Throw in some Hatch Green Chile seeds with your handful of Smokehouse BBQ, and it’s like eating a fajita. 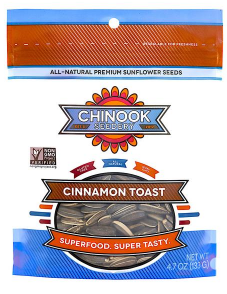 At first glance, a Cinnamon Toast sunflower seed sounds a bit odd, and that pretty well describes our experience. These were not our favorites. We are sure there are people that will like the sweet seed flavor for munching at a baseball game, but not us. Nothing about these taste bad, it just doesn’t line up with what we want out of a seed. We did not get a chance to try the Dill Pickle. We would expect them to be pretty good considering it is one of our favorite flavors in other brands. Chinook’s larger seed type might make the experience even better. The Hatch Green Chile seeds are very good. It recreates the branded Hatch Green Chile flavor very well and the spice is a good touch. Not too overbearing in its flavoring, we could pound these all days. 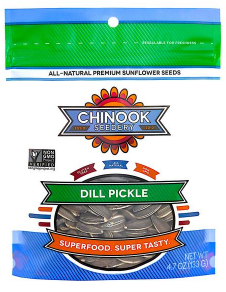 The Original Chinook Seedery seeds are just what you would expect from the original flavor. A very traditional salty taste and extra large seeds make these seeds an original lover’s go-to bag of spitters. As a kid, we loved the original flavor. Now, as more flavors have entered the market, we prefer something with a different taste than just salt. But, these Originals add volume and zing to any other bag in the Chinook line, and there is no shame in mixing and matching. 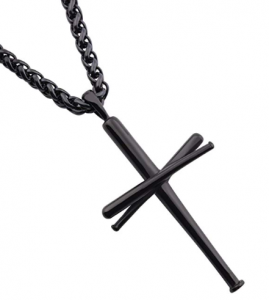 Looking to buy a baseball bat cross necklace? You’ve got plenty of choices. They are actually more popular, in terms of search volume, then BBCOR bats. The necklace usually consists of three bats formed into a cross. Two are the cross bar and the other is the height. These represent the Father, Son and Holy Ghost. You might also like our Swingrail review. 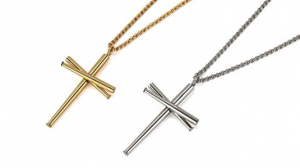 If you are looking for the original baseball bat cross necklace then look no further than the All In Faith versions. These are, in large measure, the same cross necklaces that many major league baseball players have. Pricing in the all in Faith versions range from the just under $50 to over $500 and upwards. The expensive ones are gold or silver and can be made custom. They take their baseball cross necklaces serious. The All In Faith made our gifts for baseball players. HZMAN cross necklaces are inexpensive but come with a cool design and in a few different colors. This is not an actual baseball BAT cross necklace. But, instead, a baseball necklace. It is durable considering it’s cheap. 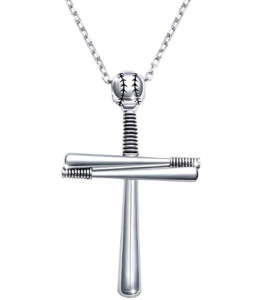 The best rated baseball bat cross necklace is the Men’s S925. This is a basic, unbranded, 3 bat cross necklace that comes in at a fraction of the cost of the All In Faith. It’s built well and, although inexpensive, is far from cheap. It is unpretentious and straight forward. We are huge fans and this comes highly recommended by us. 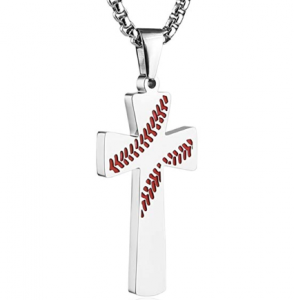 Although not an actual cross made out of bats, the Athlete’s Cross necklace is a pendant with an engraved baseball and cross insignia. On the back of this pendent is the scripture on Luke 1:37: With God All Things are Possible. It runs affordable and, if you want something a bit different and don’t like the full on bat cross this will do you some good. RMOYI is a foreign company that makes a type of stainless steel into a black three bat cross design. Most reviews think the neckalce is a great steal. Simple and without much fanfare. This is an imported produce that will fit the tight budget of a sibling or teammate gift. 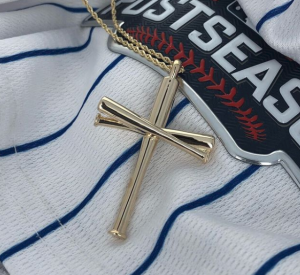 Javier Baez is likely the most popular baseball bat cross necklace wearer. Although there are several more. He wears, as far as we can tell, the All In Faith version. These are generally the most expensive, most well known and some of the better quality we have seen. If you are looking to save a few dollars on your baseball bat cross necklace, we recommend a 316L stainless steel cross necklace from a major retailer who accepts returns, like here. 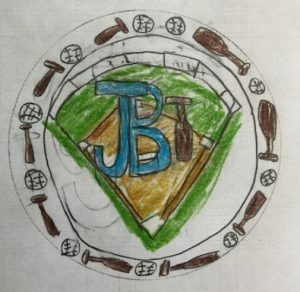 As of the writing of this article, over fifty major league players and countless more minor leaguers are showcasing two very important parts of their lives: baseball and their faith. The cross itself is formed from the union of three crossed baseball bats. These three bats symbolize God the Father, God the Son, and God the Holy Spirit. This Trinity lies at the center of every Christian athlete’s core beliefs. 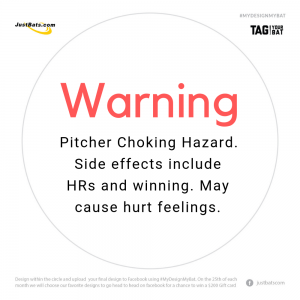 This pendant allows baseball players and fans alike to showcase these beliefs on and off the field. 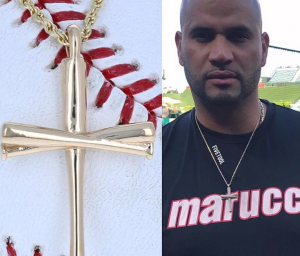 There are a number of off brands producing inexpensive baseball bat cross necklaces. You can find the vast majority of these with a search like this one on Amazon. These range from just a few dollars to closer to $50. 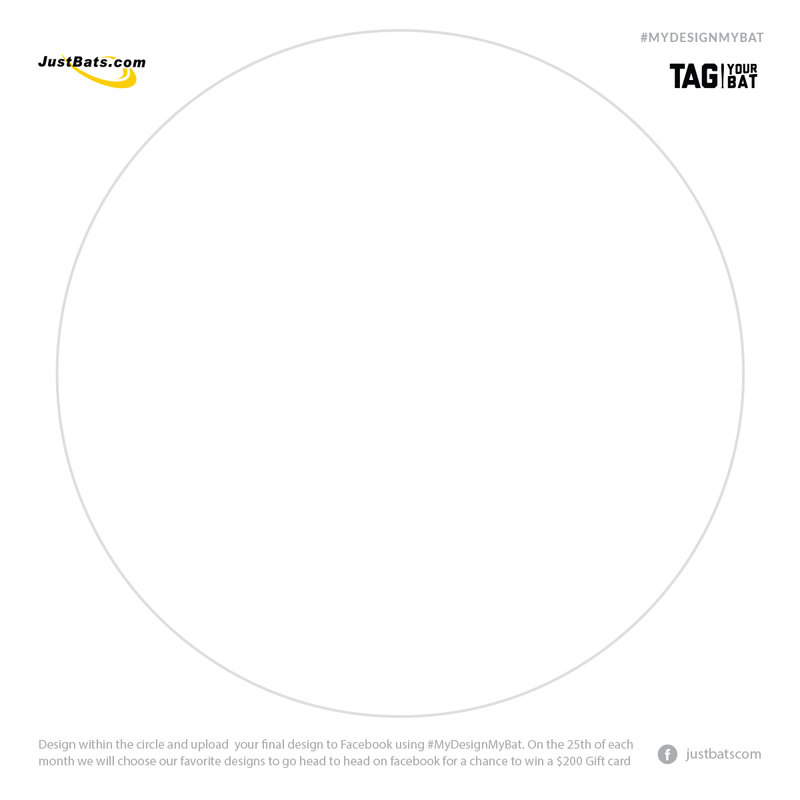 Our experience with these types of products is you generally get what you pay for. Cheap chains, necklaces and pendants don’t appear to last very long. If we were to buy one on a budget, then we recommend finding one in a 316L Stainless steel. 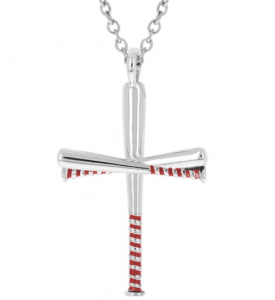 If you are willing to afford more, then take a look at the Five Tool baseball bat cross necklaces below. All in Faith, www.allinfaith.com, is now the parent company of the “Original FiveTool Necklace”. They are the original cross necklace makers and produce a more expensive, and higher quality product than is found on places like Amazon and eBay. Generally, Five Tool cross necklaces are the necklaces you see around MLB players’ necks. All in Faith comes from very humble beginnings, going from only offering a single cross to eleven different styles of necklaces in gold, silver, and for the high roller, one a 14k diamond studded version. Below we will give the specs, along with prices of their top five necklaces sold. All in Faith hand makes all of their necklaces out of .925 sterling silver, 10k or 14k gold. Necklaces are available with or without a stainless steel chain or solid gold rope chain. Handmade items can take up to 6 days for delivery. Standard 2.0 silver pendent is 1.5 in long by 0.95 in wide with optional chains ranging from 18 to 24 inches.The price point for the standard 2.0 is $69.99 to $74.99. 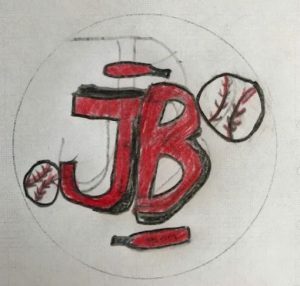 The main difference in this model is that at the top of the center bat is a baseball that the chain runs through instead of the standard closed hook on the original. Custom number pendent is 1.4 in long by 0.85 in wide with optional chains ranging from 18 to 24 inches. The price point for the custom plate pendent is $84.99 regardless of chain length. 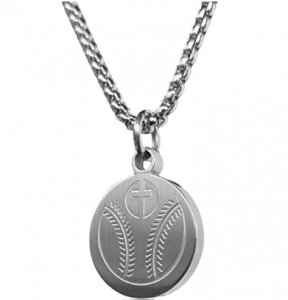 This necklace includes a homeplate in the center of the cross with your selection of number from 0-99. FiveTool also has gold varieties of the above necklaces ranging from the 10k gold standard at $285 to the 10k XL standard with a 24 in gold chain at $2055. We put VukGripz on a bat and hit with it among several different hitters to write this review. In short, the VukGripz feel is different than any grip on the market. Small microfibers pointing outwards on the grip give your hands a floating feel. That loose grip encourages quicker hands and a faster bat speed. As well, the bat grip works well wet. 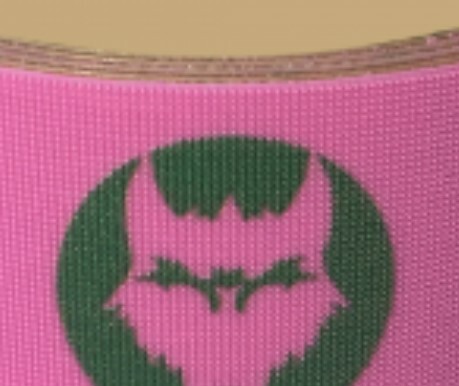 The VukGripz tackiness is derived from its unique fiber structure not from the materials tackiness. This means the grip will (1) work in all weather and (2) last a lot longer than other traditional rubber/synthetic type grips. Do we like it? Well, read below for more details. But, as a hint, it did make our gift guide for baseball players. Find the best price here on Amazon or here on the VukGripz site. For bat speed, we weren’t able to measure any differences with our Garmin Impact sensor. But, we don’t think that, or any swing speed analyzer, accurate enough to measure small differences in swing speed. Loose hands do increase bat speed. And an encouragement or reminder from your grip to keep your hands loose is useful. Our general sentiment is a more confident bat grip will give them a faster swing than any actual tech in the grip, but that’s just a guess. What might be the grip’s most unique feature is it’s lack of response to weather. That is, a wet VukGripz feels the same as a dry VukGripz. Wet doesn’t effect it like the Lizard Skins of the world–which keep their grip based on the materials tackiness. 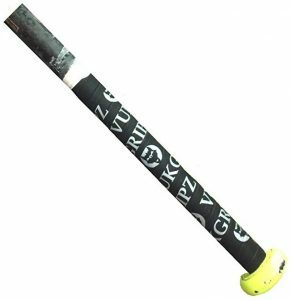 But, the VukGripz brilliance is centered in the grips unique structure. The small fibers pointing outwards on the grip are not effected by wet. As such, the grip delivers consistent traction in any condition. On the whole, the grip is recommendable. Those who play in a lot of wet weather should give it a try. As well, those looking for something different will really like it. It really is like no grip you’ve tried before. As well, if you hate how your grip, even the nice ones, loose their tackiness overtime then we think you’ll fall in love with the VukGripz. We did struggle to put the grip on an asymmetrical knob. Not just an Axe bat, but even a wood at with a big tapered knob. We think the lack of stretch in the grip didn’t allow us to compensate for the fact the handle wasn’t a perfect cylinder. For bat’s with a perfect cylinder along the handle (most aluminum and composite bats) the grip went as easy as any other grip. 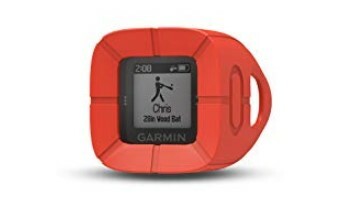 The Pocket Radar Ball Coach has been on our holiday gift guide for 2 years running. It might be run off the list this year. Not because we stopped liking it (we use it all the time), but because Pocket Radar released a Smart Coach version. This new version has a number of functions that are made possible by a Bluetooth connection within the radar. This tech, coupled with an app on your smart phone, make tracking ball speeds remarkably simple and smooth. The Smart Coach is the Ball Coach on steroids. See below for more differences. Find this on Amazon. 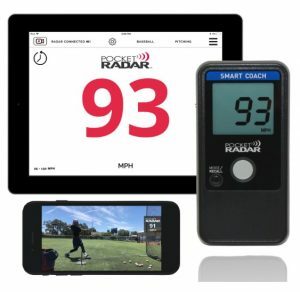 You can also check out the Smart Coach directly on the Pocket Radar site. We talk about the functionality and accuracy of the Ball Coach in our Pocket Radar Ball Coach Review. In short, it works. As long as you are able to stay inline with the ball (either behind a backstop or directly behind the pitcher) you’ll get accurate readings. (We tested ours against a Stalker Sports 2 Gun—which we ended up selling because the Ball Coach filled all our needs). That radar technology, which we like so much in our Ball Coach, is also in the Smart Coach. The Smart and Ball Coach both have a hands free operation option, memory recall, accurate inline readings and a 120 foot range. As well, if you buy it from the right place, you get a 2 year warranty too. The real magic in the Smart Coach, and why it prices out about $100 more, is the Bluetooth functionality. The Smart Coach connects to your smart phone’s app without wires. 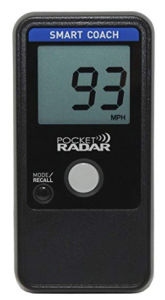 This allows the speed readings to manipulate a Pocket Radar app that tracks exit speeds and repetitions as well as syncing that information with video and providing a history. 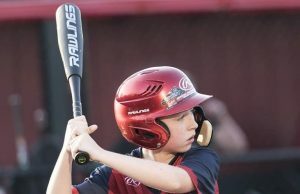 If all you need is the simple exit speeds on an occasional pitch or two—or an exit speed on a hit ball—then the Ball Coach should serve you well. However, if you’re looking for more data tracking and a smoother ability to create video with speed readings then the Smart Coach will serve you perfectly. Note, as well, the Smart Coach comes with the possible of working by plug as well as using batteries. The Ball Coach is only a battery device. Obviously, the Smart Coach from Pocket Radar offers exit speeds. This can be set on either a continuous mode or a single push mode that only reads when you have your thumb or finger on the trigger. The single push mode uses less battery than the continuous mode. The exit speeds are as accurate as we have ever needed them to be. It does not do multi-directional radar—so hitting live pitching is a bit difficult to track and requires patience. But, tee work as well as pitching and any other type of sport where there is a predictable ball path will be easily tracked. It works up to 120 feet. 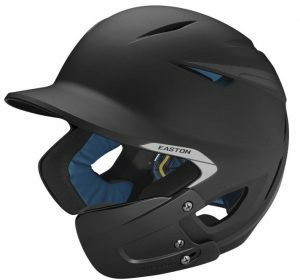 Because it is a radar it does not differentiate between baseballs, softalls, tennis balls, cricket or any other number of options that are moving. You could use this for soccer or just about any other sport that uses some sort of moving object (even bowling). Both the Smart Coach and Ball Coach could work for any sport. But, again, the app functionality is only available in the Smart Coach version. What might be the most unique feature, the Smart Coach can overlay speeds on the video. See our demonstration of this in the video above. We are not aware of any other device that delivers that feature. The app also gives you the ability to control the radar from the app like a remote. So, as it is sitting across the field you can turn it on and get readings without ever needing to go to the device (assuming it is paired already). We like the Rapsodo we use. 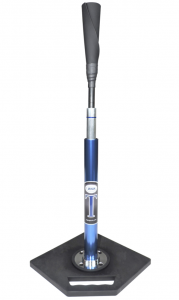 It has multi-directional ability and a great interface for multiple hitters and spray charts. But, the Rapsodo is very difficult to set up compared to the Smart Coach. The Smart Coach requires a spare hand at a minimum. If you want to be exciting you can get a tripod and attach it to the Smart Coach via a clip Pocket Radar has. 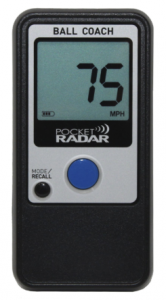 Consider this too: the price on the Rapsodo is ten times that of the Smart Coach. Unless you need multi directional hitting metrics (like we often do for our exit speed tests) then you’ll find the Smart Coach to serve a ton of functionality in your baseball and softball coaching bag. 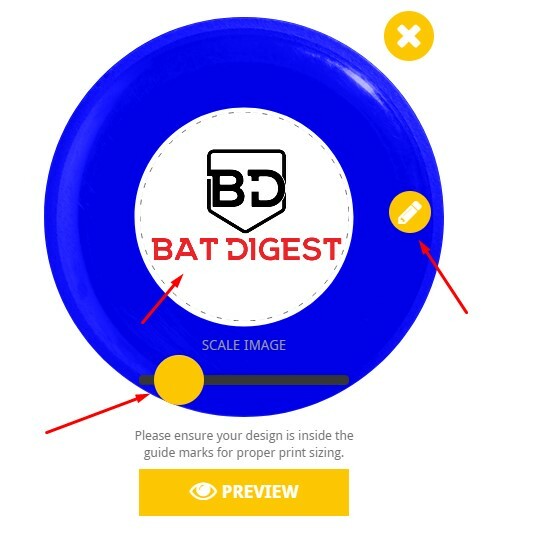 The backspin tee is a hitting device that hangs a baseball over the plate to reveal the part of the baseball that should be hit. The pro model also puts the ball at an angle like it would if it were being pitched. These are advantages over traditional tees which hold the ball over the plate and, at least some, cover the part of the ball which should be struck. Contact with the bottom of the ball AND the right swing path create optimally struck balls. This is why the Backspin tee has won awards, gets great reviews and is at the practice fields many MLB and College teams. See the best traditional batting tees. Where to buy the Backspin Tee? As Backspin increases their distribution, the best place we found to buy the device is on Amazon here. You can also check out the Backspin Tee’s website. Looks like pricing is the same in both places. Our experience with smaller vendors is the deals will more likely be found on their site than on Amazon who, of course, takes their cut. Does the Backspin Tee Really Work? How does the ball stick in the tee? Do tradition tees produce more topspin? Generally, we think the question does the backspin tee really work likely misunderstands the point of the backspin tee. You can hit a ball off a traditional tee with the same angle and spin that you could with a backspin tee. But, the point of the backspin tee is to present the ball more replicable of a real pitch that requires a successful swing plane. The backspin tee suspends the ball at the angle of a pitch and exposes the part of the ball that should be hit for success. While traditional tee replicates a perfectly flat pitch (which never happens) and holds on to the ball about right where contact should occur. In that sense, the Backspin Tee works perfectly. It is a revolution for a product that most never dreamed could be improved. We spent some time exchanging emails with the folks at Backspin tee. These are the questions we honestly had, and their answers are candid and useful. The benefit of an upside down tee is probably one that is not common knowledge. A suspended ball in the air being held in any fashion has no benefit over each other. Its what is being covered and where the rubber is placed is where the benefit really shines. When you a batter hits the top half of the ball on a normal tee, they hit all ball, and hit a ground ball. In a cage, they might think this is a good result. Off our tee, if you hit the top half of the ball (the part of the ball the pitcher wants you to hit) you hit our rubber cone and get immediate negative feedback to change. On the flip side, if you hit the bottom half of the ball on our tee you hit nothing but the ball with positive feedback. Of course, on a normal tee you might be hitting the rubber on bottom half of the ball hits and then getting a negative feel. Also, for good hitters consistently hitting the bottom half of the ball you will wear out the rubber possibly quicker on normal tees meaning you will have to financially replace the cones in the future. Our Lifetime Warranty will never put this as an issue for our customers. The ball holds in the cone with surface tension. You simply turn the ball into the rubber cone allowing the rubber to physically squeeze down onto the ball. The only people that have issues with this are the ones trying to push and jam the ball up into the rubber. Its a very simple and easy loading process. Our customers are very pleased with this function. We use different size cones for both baseball and softball cones, but they are very easy to transition between when needed. The Back–Spin Tee’s focus is to produce an on plane swing path, and hitting the correct part of the ball with that swing path. When you hit the bottom half of the ball with a good swing plane, you automatically will produce a desired line drive launch angle (yes, that means in the air) and it will result in having the proper amount of backspin. Remember, backspin is a result of where you hit on the ball, not something you can add more or less of on command. A traditional tee does not produce more topspin because their rubber is under the ball. However, exposing the part of the ball that you don’t want to hit could and has caused hitters trouble when trying to hit what they are aiming at. Ex. “Staying on top of the ball”. Our Pro Model is infinitely adjustable by the millimeter. It weighs 18lbs, and is very easy to break down into its three parts. It also comes with a Launch Angle Chart, and a laser cut carrying handle. The Youth/Pre Game Model breaks down into 2 pieces, weighs 10lbs, and is not adjustable. 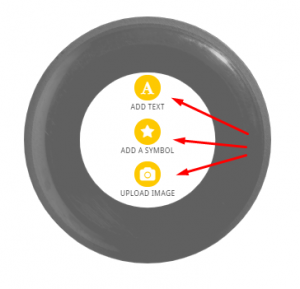 It is set to hold the ball 26″ above the ground. This tee is designed for any serious ball player that wants to be more perfect in their training. You won’t mis-hit on our tees and enjoy it. You are challenged to swing fast, and precise. Having said that we have tee sales from ages of 7 year olds to the Major Leagues. There are tees in 29 of the 30 MLB Teams that we are aware of, and hundreds of colleges in both baseball and softball. Our Bat Seats are for sale on our website, and our customers love them! 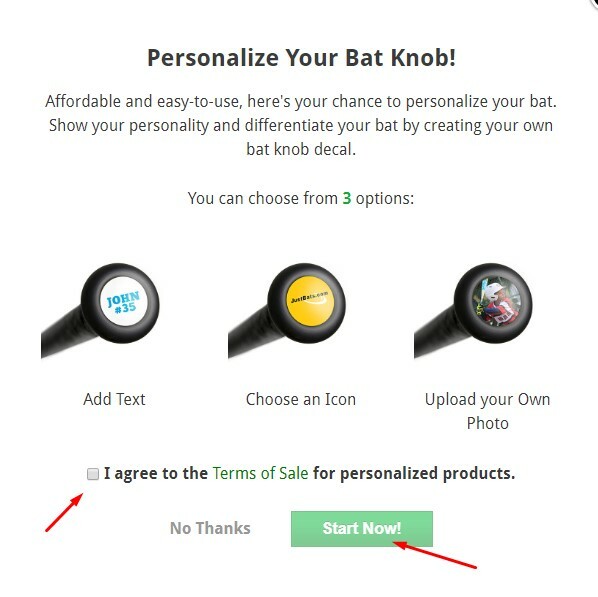 Very practical, and user friendly on their bats. There are a number of fantastic options for great batting tees on the market and we’ve tried most of them. 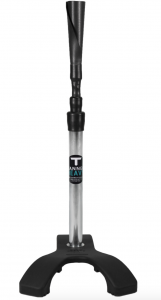 As a consensus, Just Bat Reviews writers and players like the Tanner Tee Heavy as its overall best batting tee. However, the Atec T3 tee also received high marks. We discuss our reasoning below as well as some options for any one looking for the top hitting tees. Hitting a baseball… one of the most frustrating, yet rewarding things an athlete can try to do. How can a player best prepare for a piece of leather less than 3 inches in diameter hurtled toward you anywhere from 40mph at the youngest ages to 95mph+ at the elite levels? How can that athlete make their round boomstick hit that ball and make it move forward into the field of play? Continuous practice, high numbers of repetitions, different scenarios… repeat. 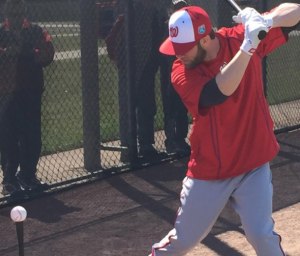 Not everyone has access to a pitching machine, let alone the space needed to successfully get in the number of reps needed to be successful at hitting a baseball. The best answer to this situation, and by many, the fundamental piece of developing a “big-time swing”, is tee work – and a lot of it! If a player dedicates themselves to work hard, why should they work to refine their skill with subpar equipment? Today, we look at some of the top batting tees we have tested and one that is new to the game of pro-level equipment. Expensive Tees vs Rubber Tees? The Tees we discuss below might be in the eyes of many when comparing to the hard rubber tees you can buy at the many big chain retail stores. But the durability, functionality, and ease of continued use will make the investment well worth it! If you are serious about tee work then we think, to put it bluntly, the cheaper rubber tees you might purchase at major outlets is a waste of money. They break quickly—especially if you are using it with serious ball players. If you are even remotely familiar with the game of baseball, you will have heard of the brand Tanner Tees. From little league up to the most elite levels of baseball, Tanner Tees are a staple in every practice facility or hitting cage. Today, we are going to look at the two Tanner Tees that make it to the top of our list. How can you not look at a baseball tee and see that it has an endorsement from hitting legend Tony Gwynn? The Tanner Tee – The Original is and has been the standard for batting tees for over 25 years. This tee is hand crafted in Sarasota, Florida. The tee is comprised of two parts – the adjustable stem and the weather resistant polymer base. What sets the Tanner tee apart is the hand-rolled FlexTop. 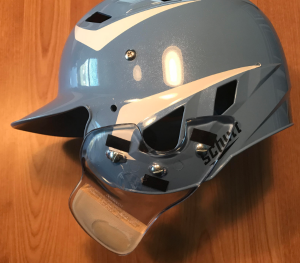 The FlexTop is an extremely flexible, yet sturdy rubber role at the top of the stem allows for the bat to pass through the contact point without much interference. This is a total difference in response you will receive from the typical rigid plastic stem that many major brand tees offer. If you miss-hit the ball or swing lower than intended, the tee will receive the impact and fall over. This is not the case with the Tanner Tee. It is recommended, however, that you either have something to weight the tee down or purchase a tee weight that is available to ensure the most available reps per hour without having to pick up the tee from bad miss-hits. The Tanner Tee – The Original is available in three sizes: Adjustable 16-23in (Low Ball), Adjustable 20-32 (Youth/Short), and Adjustable 26-43in (Adult/Standard). We recommend the Adult/Standard model for all of those out there looking for a tee unless you are in the early years of youth ball (5yrs to 9yrs). 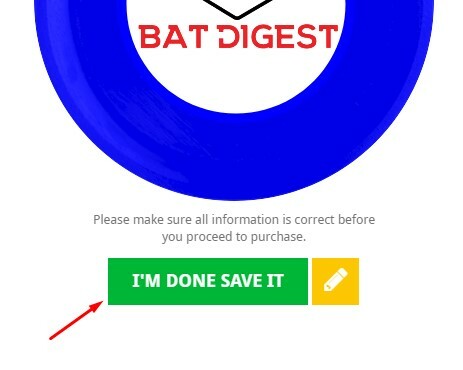 The hitting cage at JustBatReviews.com is a long-time user of the Tanner Tee. The Tanner Heavy tee takes “The Original” by Tanner and adds a 10lb. heavyweight base built in, all other size options are the same. The tee base is designed with three points of contact, which allows for maximum balance, while decreasing the likelihood of tee creep or knock-over from a tee-killing swing. I have found that this model is really solid as it can sit on a raised home plate and sit perfectly without leaning the tee because half of it is on the plate and the other half is on the ground. There is little, if any, need to have a tee weight involved in the setup here. 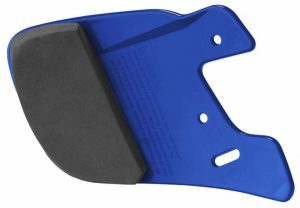 It is a great replacement for the Original Tee with a tee weight if you are looking to simplify the mobility of the tee from home to facility to the batting cage. The other great part that I feel this tee brings is that the bottom plate is not a solid square. The hitter can still see the majority of the white plate below when swinging and not have a blacked out square due to the base of the tee. This would be a great option for tees that mostly stay in one physical location. See our full review on the Backspin tee here. 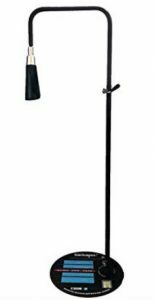 I have recently had exposure to this batting tee and it is very nice and solid. It feels very similar to the Tanner in its stem and base. The Atec T3 Professional Tee is built with industry leading materials to minimize swing interference and maximize positive contact zone. This tee is very portable and easily moved to what ever environment you are trying to use it to improve your hitting skills. This tee includes a high density base which is good for stabilization. I do recommend, however, the very slick tee weight that slides over and fits on the base to control the tipping effect. I think this is a much nicer accessory to stabilize the tee as opposed the sand bag that is typically used with the Tanner Tee – The Original. If you want to try an alternative to Tanner Tees, this might be the one. Jugs has been known for a long time in the world of pitching machines. In fact, they are the #1 selling pitching machine company in the world. The Jugs T seems very similar to the Tanner Tee and the Atec Professional T3 above. 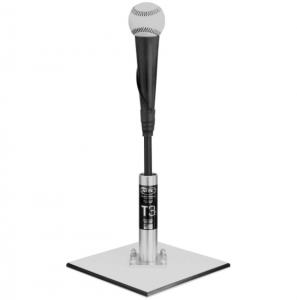 The tee is adjustable from 24″ to 46″ inches to allow hitters to work on mechanics throughout the strike zone. The claim of the Jugs T is that with its total weight of 10lbs, there are no extra accessories needed to keep the tee on the ground and not tip over. One nice addition to this tee that the others lack is a built in handle to carry the tee. 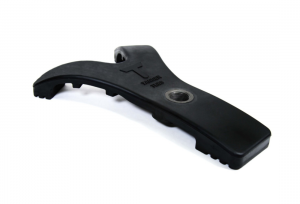 The Jugs T includes a patented grip-n-go handle on the base for easy transport. In the end, tee work will make a hitter better. It comes down to how much and what drills you do to take that next step in your skillset. We do recommend, however, that you invest in a piece of equipment that will stand the test of time and make the sessions as effective as possible. The tees listed above start around $80 and move up to $115. Professional level tees provide a professional level experience for the hitter. 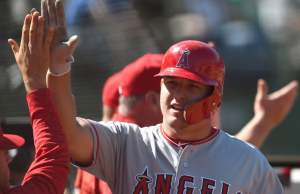 Why give your hitter a sub-par piece of equipment?